Iraqis gather at the site of a car bomb in Mosul, Iraq, Nov. 9, 2018. The previous night's explosion killed three people, the first such attack since jihadists were ousted from the city last year. A deadly car bomb in Iraq's Mosul, the first since the city was recaptured from jihadists, has left residents shaken and terrified that past nightmares are returning to haunt them. The blast late Thursday hit the popular Abu Layla restaurant in Mosul, the northern city that for three years served as the Islamic State group's Iraq headquarters. When residents awoke to the scene of destruction on Friday morning, they feared their bloody past with IS was not yet behind them. "We were liberated, so we thought that security was back," Mossab, a 25-year-old restaurant employee, told AFP. "But now it's worse than ever." Iraqi security forces inspect the scene of a car bomb explosion the previous night in Mosul, Iraq, Nov. 9, 2018. Mossab's car, parked nearby, was one of them. "I've been working for four years to save up to buy it, but it all went in the blink of an eye," he said, devastated. "If the security situation stays like this, then our future is in the gutter," he told AFP. Troops and paramilitaries recaptured Mosul in July last year, months before the government declared IS had finally been defeated in Iraq. 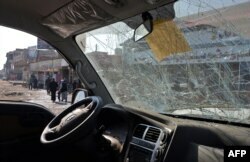 Iraqis are seen through a damaged car in Mosul, Iraq, Nov. 9, 2018. A car bomb that killed three people and wounded a dozen on Nov. 8, 2018. Security forces frequently arrest suspected jihadists or break up sleeper cells, and are still uncovering jihadist tunnels and hideouts in Mosul. There was no immediate claim of responsibility for Thursday's attack, but a statement by security forces blamed it on "terrorists." Ali said Iraqi officials were at least partly to blame for Thursday night's attack. "If they weren't able to protect the city, they shouldn't stay," he said angrily. "The only thing these officials want are senior posts. They told us, 'IS is finished' — but then there's a car bomb that kills innocent people." 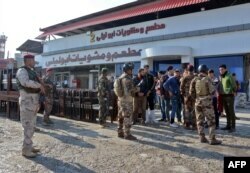 "One of the main reasons we're seeing a deterioration of the security situation is that there are too many decision-makers," said member of parliament for Mosul, Ahmad al-Jarba. Between Iraq's central military command and the Hashed al-Shaabi paramilitary force, both of which are stationed in and around Mosul, there were mixed signals on security, Jarba said. Mosul's residents have shouldered much of the rebuilding themselves, opening restaurants and shops along the Tigris river that divides the city in two. But after Thursday's blast, the specter of IS seems closer than they had thought.